The M32-3 is supplied wired for monaural recordings. Double loop pin jacks are attached between the Right and Left terminals and between the two ground terminals. For Stereo channel reproduction of stereo recordings, remove the loop pin jacks and use and N32E stylus. For single channel reproduction of stereo recordings, do not remove the double loop pin jacks but use and N32E stylus. 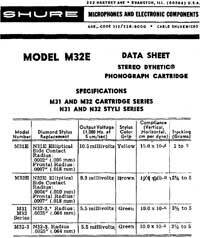 Shure M32 / M-32 owners manual, service manuals and schematics are for reference only and the Vinyl Engine bears no responsibility for errors or other inaccuracies. The PDF files are provided under strict licence. Reproduction without prior permission or for financial gain is strictly prohibited. This website is not affiliated with or sponsored by Shure.